To register for an Ice Fest clinic or climb, it’s best to speak with us directly by calling 603-356-7064. This is to ensure you are signing up for the appropriate program and that we have space available. If you would like to initiate the process on-line, you may do so by filling out the pre-registration form on the Contact page. Please note, if you e-mail us it is for pre-registration only and your registration must be confirmed by the climbing school in person or by phone. We require 100% payment for Ice Fest programs at the time of your reservation. Ice Fest clinics have an average 4:1 client to guide ratio. Please note that each group clinic requires a minimum of 3 participants, for smaller groups standard rates apply. All Ice Fest courses must be paid in full at the time of reservation. Regular clinics are $175 per day, book 2 or more days for $165 per day. 10% discount for undergraduate College Students on your first ice climbing clinic day! 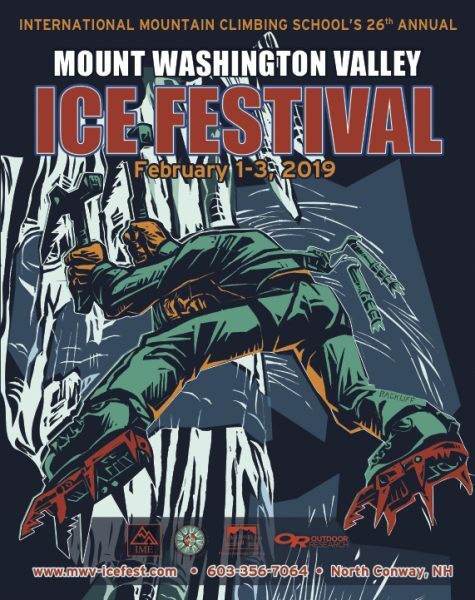 You must mention you are a college student at the time of registration and you must bring your valid undergraduate college ID to the ice fest. Your first ice climbing clinic day is 10% off! Sorry, doesn’t apply to graduate students or to the already discounted College Ice Climbing Clinic. All reservation changes or cancellations are subject to a $50 administration fee. Due to the complexity of this event, any cancellation within 10 days of the event is subject to a forfeit of 100% of your course fee. Part of what we teach in our winter programs is how to deal with adverse weather conditions, so we will go out in all but the most miserable conditions. On Mt Washington ascents, we will attempt the climb in all conditions, if weather or avalanche danger turns us back, that is all part of the mountaineering experience and there will be no refund or credit. 2733 White Mountain Hwy. PO Box 1666.